We have no doubts that driving a HGV is a challenging task, with car drivers always cutting you up and others undertaking in your blind spot, and that's before we get to the task of juggling dozens of gears every time you approach even the smallest of inclines. However, the bare minimum we'd hope for from our lorry drivers, is that they have some sense of spacial awareness. You know, a little recognition that every time you make a really tight turn that the rear of the trailer may swing out wide. But...this driver hasn't quite understood that. 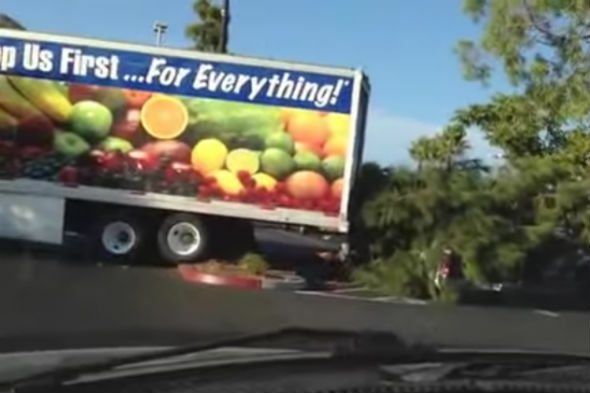 The person at the wheel may think that they're safe enough inching around this turn, but they manage to fell an entire tree with the trailer, which lands on top of an innocent pick-up truck, before then reversing into the pick-up for good measure.